The highest form of food preservation is ice cream, according to the Climate Crusader. The harvest season is just reaching its high point here where I live. Farmers' markets are full to bursting with local fruits and veggies. If you're a locavore - or just toying with eating more local food - this is the time of the year when you might find yourself doing a lot of food preserving. And while I enjoy canning, drying and freezing, in my mind the pinnacle of food preservation is homemade ice cream. Years ago, I used to eye ice cream makers with envy, but I didn't buy one. For one thing, they're not exactly super-cheap. For another, I wasn't sure I would actually use one. I really do love ice cream, though, and I had concerns about a lot of the ingredients in the ice creams on store shelves. Modified milk ingredients. Artificial flavours and colours. Gums and pastes and words I couldn't pronounce. Of course, there are organic ice cream options, and natural ice cream options, and some of those are fabulous. They're a real splurge, though, and I have two little kids. The result is that I was eating less ice cream than I otherwise would. This isn't necessarily a bad thing, but it did make me a little sad. All of that changed, though, when a friend who was moving across the country gifted me with her ice cream maker. Now that I have an ice cream maker of my very own, I can make sweet frozen treats with ingredients I choose. Real organic milk and cream. Fresh, local fruit. Ice cream sweetened with honey or maple syrup instead of sugar. Ice cream made with coconut milk instead of cow's milk. Fruit sorbets. And of course, lots and lots of chocolate ice cream. Nothing icky or surprising or unpronounceable at all. You can even store it in glass containers if that makes you happy. Making ice cream is pretty easy - I would say it's similar in effort to making cookies. You mix it up, set the ice cream maker, and come back in 20 minutes. The ice cream maker is a little noisy and the bowl takes up space in my freezer, but the end product more than makes up for it. Getting back to my discussion about food preservation, I thought I'd share my generic fruit ice cream recipe. You can use berries, cherries, peaches or even cooked pumpkin (in which case I'd definitely add some cinnamon and cloves). Store the bounty of the harvest in the best possible form: dessert. Wash your fruit, and pit and slice it if required (I don't slice raspberries or blackberries, I do slice cherries, peaches and strawberries). If you're using pumpkin, cook it and allow it to cool first. Add the sugar and stir well, then let it sit for 20 minutes. You can also leave them in the fridge overnight if you're not feeling too impatient.This will draw out the juices, and allow the sugar to dissolve nicely. Once the fruit and sugar have had a chance to blend, mash it or run it quickly through a blender or food processor. Add the milk, cream and vanilla, stir well, and freeze in your ice cream maker according to the manufacturer's instructions. Yield: Approximately 2 quarts of ice cream. 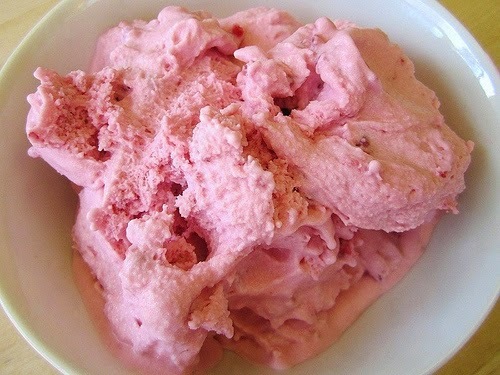 We made homemade strawberry ice cream using strawberries purchased the day before at the farmers market. DEEEEE-licious! My husband gave me a super expensive ice cream maker for my birthday. I wouldn't have spent that much, but I'm making sure it gets put to good use. A fabulous form of preservation to be sure! I haven't made homemade ice cream in eons but this reminds me that I should get out my ice cream maker and put it to good use.